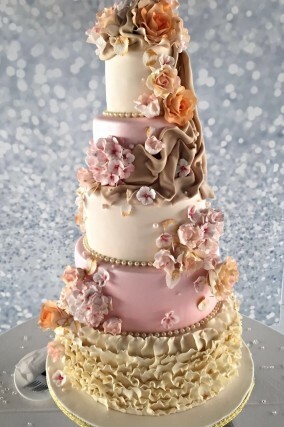 The term “vintage” is thrown about more than any other in the wedding industry, especially when it comes to cakes. In the past five years, there’s been a surge in the number of vintage-inspired wedding Cakes. If you are looking for a cake that wouldn’t have looked out of place on your grandma’s wedding day, then Vintage is for you. Flowers really are a vintage favourite. They were symbolic wedding choices, roses and orange blossom were top of the list because they’re known to promote love, marriage and fertility. You can add sugar craft versions to your design, but displaying fresh flowers between every tier is more authentic. Lace is a big trend Some brides choose to add actual pieces of lace to their cake, but it’s more faithful to work the lace you love into the cake’s decoration, on every tier or just small sections. We can also match the lace from your dress to your Wedding Cake, when you visit us for your free consultation please fetch any pictures or material samples you may have.